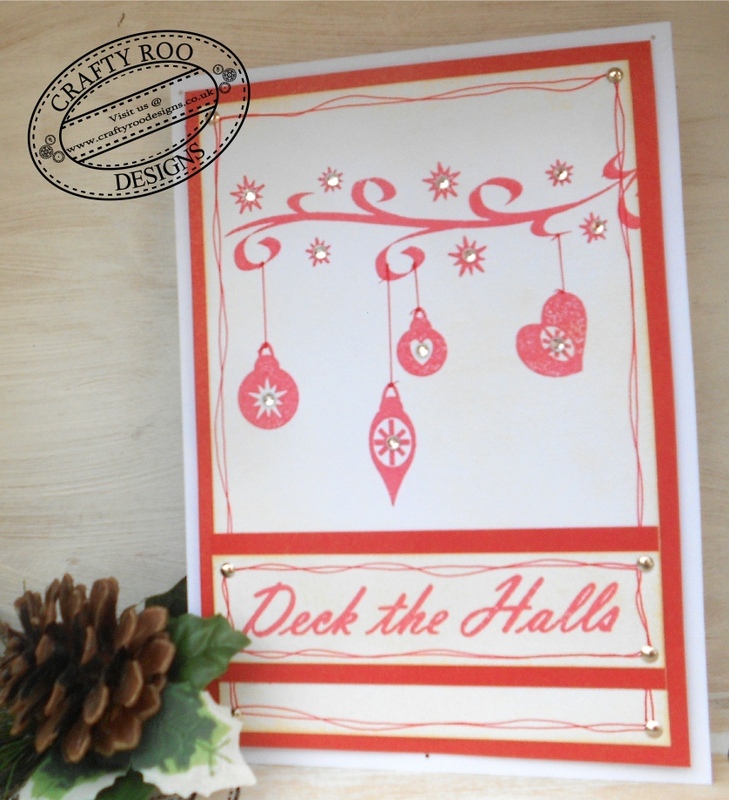 This set (Deck the Halls - Set 2) proved to be a big hit at Ross Papercrafts show up in Nissan last Sunday, people couldn't believe how quickly you can make a fab card. I started by cutting up all my card first so in red I cut a 13.5cm by 20cm and a 12.5cm by 3cm. In white I cut a 12.5cm by 19cm and a 12.5cm by 2.5cm. That all done I distressed lightly around the edge of the white cut pieces using Scattered Straw (this helps to make the red look red"er"). Across the top of the large white piece of card I stamped Sparkle Flourish in Memento Ladybug and then the four baubles (Christmas Minis Set 2). I then doodled around the edge and added the string between the flourish and each bauble. 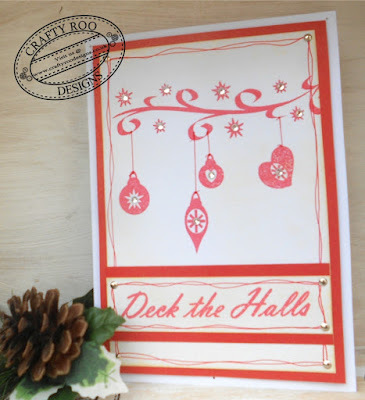 Onto the thin strip of white card I stamped Deck the Halls doodled around the edge, mounted this onto the red and added a gold brad to each corner. This was then attached to the large piece of white card, and again this was mounted onto the red card, brads added and then attached to the front of a white A5 card. So that was quick wasn't it! These stamps can be bought as a set or individually so, if you like this set or would like to check out more of our stamps then hop over to our website! Monthly Make and New Stamps!